One of his students at NYU, Henry Kloss, listened to Villchur’s explanation of acoustic suspension and agreed that a speaker built on this principle would be a major improvement in hi-fi sound reproduction. Villchur decided that since the established manufacturers were not interested in the invention, the only way to make it available to the public was to go into business producing the new speaker. Kloss had a loft in Cambridge, Massachusetts where he was making loudspeaker cabinets, and the two men became business partners in Acoustic Research, Inc. (AR) in 1954. The partnership lasted until 1957, when Kloss left to form KLH, manufacturing loudspeakers using Villchur’s acoustic suspension principle, under license from AR. Over the next two decades, all major loudspeaker manufacturers gradually changed from mechanical to acoustic suspension. At first they did so under license to AR, paying royalties to use the principles of Villchur’s patent. When the Electro-Voice Company refused to pay the royalties, AR sued them for patent infringement. Electro-Voice countersued, claiming prior art in the form of a mention of an air spring in a different system. The ensuing lawsuit resulted in the loss of the patent for Acoustic Research, a decision which Villchur chose not to appeal. In an interview about the case, Villchur says that he knew the judge’s decision to void the patent was incorrect, but that he felt he had better things to do than to spend his life in litigation. He cited the example of Edwin Howard Armstrong, the inventor of FM radio, whose patent was rendered unprofitable through the actions of RCA. Armstrong spent years unsuccessfully fighting that injustice, and eventually committed suicide. Villchur decided not to contest the loss of his loudspeaker patent, but rather to move on and continue improving the quality of high fidelity equipment. The first acoustic-suspension loudspeaker, the AR-1, was introduced at the New York Audio Show in 1954, and was an instant success. Villchur continued to improve loudspeakers, coming out with new models roughly every two years. The AR-2, produced in 1956, was a no-frills version of the speaker at a lower price. The independent testing agency Consumers Union, publisher of Consumer Reports magazine, did a report on loudspeakers that year. The AR-2 was one of only four speakers that received the Check Rating for highest quality, regardless of price. Of the four speakers that received the check rating, two were made by AR, and two were made by KLH under license from AR. After the CU rating, sales tripled. Villchur continued to research improvements in sound reproduction, turning his attention to the tweeter. He received US Patent No. 3,033,045 for his invention of the direct-radiator dome tweeter. This greatly improved high-frequency fidelity by its smooth response and wide dispersion of sound, and complemented the acoustic suspension woofer’s improved bass response. The AR-3, which combined the acoustic suspension woofer with the dome tweeter, is considered Villchur’s ultimate achievement in speakers. An example of this model is on display in the Information Age Exhibit of The National Museum of American History at The Smithsonian Institution in Washington, DC. Virtually every loudspeaker today uses Villchur’s innovations: Acoustic Suspension Woofers and Dome Tweeters. Villchur continued to do research, production design, and technical writing during his tenure as president of AR. One of his strongly held views was that the only appropriate criterion to determine the quality of high-fidelity components was comparison with the actual live music in performance. In keeping with that philosophy, AR produced a series of “Live versus Recorded” concerts in which live performances by musical ensembles were compared with previously taped performances played through AR stereo equipment. Musicians participating in these concerts included the Fine Arts String Quartet and classical guitarist Gustavo Lopez, as well as performances on a thirty-two foot pipe organ and an old-fashioned nickelodeon. The Washington Post featured the Live vs. 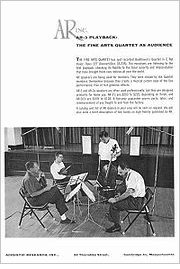 Recorded concerts with a half-page article with pictures, providing free publicity for AR, in which they said that audiences were fooled over and over by the seamless transitions between live performance and sound reproduced through the AR speakers. As president of AR, Villchur was known for progressive employment practices and innovative advertising techniques. AR used equal opportunity employment practices, and employees received health insurance and profit sharing – benefits which were highly unusual in any but the largest firms in the 1950s and 1960s. The company was also known for its liberal repair policies, fixing most products for free no matter how old they were, and in general providing excellent customer service. AR’s advertising was distinct from the sensationalistic ads of its competitors, instead concentrating on technical information, reviews by impartial critics, and endorsements from well-known musicians and other personalities who actually used Acoustic Research components. Villchur believed that each ad should provide accurate information and unsolicited endorsements in order to convince the reader of the quality of the product. 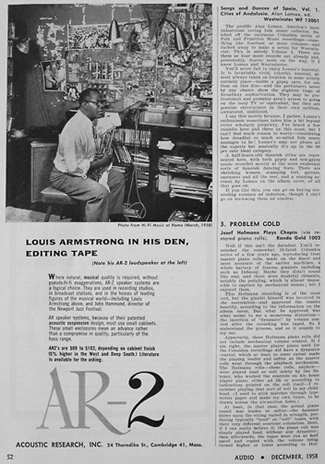 The list of well-known artists who appeared with their AR stereo equipment in print advertisements included Virgil Thomson, Miles Davis, and Louis Armstrong. 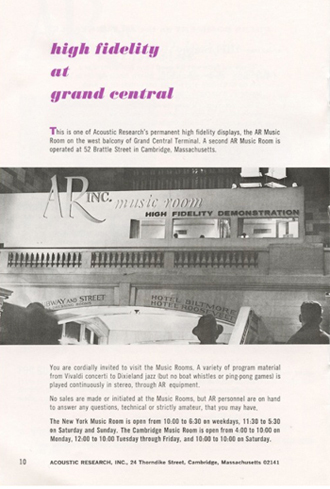 In addition, the company established locations called “Music Rooms” or “Listening Rooms,” where the public could listen to music through AR components and could ask questions of knowledgeable hosts, but where no selling took place. The most famous of the Music Rooms was in Grand Central Station, and became known as a quiet haven in the middle of the noisy terminal. During one year, the Music Room counted one-hundred-thousand visitors. In 1961, Villchur designed a turntable (record player), and published an article explaining its several innovations. The tone arm and turntable platen were mounted together and suspended independently from the body of the turntable, so that a shock to the body of the turntable would have little effect on the playing of the record. Indeed, Villchur was fond of demonstrating this independent suspension by hitting the wooden base of the turntable with a mallet while the record played on flawlessly. The mechanical isolation of the tone-arm-platen assembly from the base had a further advantage. It eliminated the “muddy” bass sound that often resulted when vibrations from the loudspeaker were conducted through the floor and caused feedback through the pickup into the amplifier. The low mass and damped suspension of the tone arm itself compensated for any irregularities on the surface of the disk so that even warped records could often be played without distortion. When released, the tone arm floated down to the record, so that if it were dropped, it would not crash into the disc (which could harm both the needle and the record). With its quiet motor and precision-ground rubber drive belt, the turntable had extremely low wow and flutter (the lowest of any turntable on the market at that time), and far exceeded the National Association of Broadcasters (National Association of Broadcasters) standards for turntable measurements. The overall look of the turntable was given an award by Industrial Design magazine. Acoustic Research continued to expand its loudspeaker line, producing the smaller “bookshelf” speaker, the AR-4, which was popular among college students and younger families. In 1966, Stereo Review’s yearly summary of the high-fidelity equipment showed that AR’s loudspeaker sales represented almost one-third of the entire market, a share that had never been achieved by any hi-fi company before that, and which has never been equaled since. In 1967, Villchur sold AR to Teledyne, and signed an agreement not to go into business in the field of sound reproduction equipment. Teledyne kept the AR name, and continued to produce stereo equipment. Although it was Villchur’s plan for the company to produce a complete set of sound reproduction components, he sold the company before the amplifier and receiver became part of the line.